Compare Two Wheeler Insurance and Save upto 60%! First, be sure of the purpose for which you would be using your bike. If you are not a regular bike user, third-party liability insurance would be the best fit. If you are a regular user, comprehensive insurance would be deemed the best fit. A number of factors contribute to the difference between third party liability and comprehensive bike insurance policy. Road side assistance cover: This helps when you need roadside assistance due to a breakdown of your two-wheeeler. This safeguards your financial loss. If your two-wheeler is lost, you can claim and get the entire sum of your insured amount without any deduction. Installed extra fancy accessories of your bike would also come under the coverage facility of the New India two-wheeler-policy. Damage-recovery to those accessories now is possible. Our insurance advisors make a difference and we stand by that. We do things a tad different from the rest of them. We figure that in a world where you can customize everything from your phones to your bike, we understand that individualization is key. You want coverage options, discounts and offers that make sense for you and that's why PolicyBachat's smart tools and technology help you tailor a Two Wheeler insurance policy that's right for YOU, not someone like you. 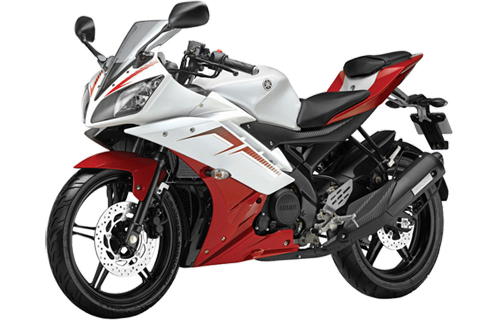 "It is very common in in India to purchase second hand two wheelers at a good price. One of the most common mistakes committed concerning bike insurance is forgetting to get the insurance policy transferred under the said circumstances - which either leaves you and your bike uninsured, or you have to buy a new plan. Else, to stay on the right side of the law, choose an insurance provider and buy a new policy or get the existing one transferred. Do this within the permissible time window of doing so to avoid penalties." Talked To Mr.Sainath, Who Was Very Helpful. Thank You. Comparing quotes online gives you the luxury of not having to waste time and effort trying to locate the best policy. 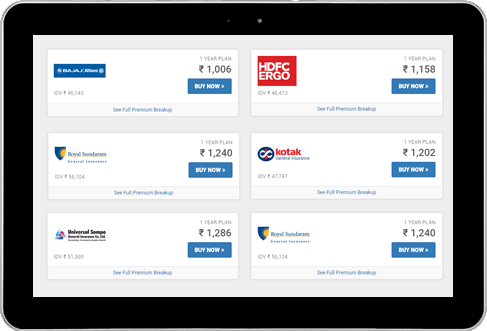 PolicyBachat simpliefies the process of looking for bike insurance and provides quotes for Bajaj Allianz, HDFC Ergo, Bharti Axa, Tata AIG, Future Generali, ICICI Lombard, Royal Sundaram, Reliance General, IFFCO Tokio, Cholamandalam MS, SBI General, New India, National, Oriental, United India, L&T Insurance etc. Comprehensive policy with Compulsory third/3rd party insurance cover as well as own damage insurance cover at very cheap prices on ultra fast insurance search engine. Plans offer cashless claim settlement in over 2000+ garages across india at lowest annual premium for two/four wheeler motor vehicle in India. Fastest Car/bike/scooter or any other 2 wheeler/ 4 wheeler motor vehicle insurance premium calculator online. To protect your privacy, your phone number will NOT be shared with anyone except for use by PolicyBachat.com to communicate with you for your Insurance needs. ?